As team captain, Laura Muir took her responsibilities seriously. Not only did she anchor Great Britain to relay victory, as one of the major draws at yesterday’s Great Edinburgh XCountry, she acted as translator for her colleagues in the hope they could lap up the backing of the enthusiastic Holyrood Park crowd. Addressing the whole team ahead of the international event, she stayed true to her roots. “There was quite a Scottish theme to the speech,” she admitted, after pulling out another gutsy and dominant run, to overhaul training mate Jemma Reekie on the final leg of the race. “There were lots of southerners there so I gave them a few pointers about what might get shouted out. I think some of them got it, but I wanted to give a homely feel to it, because it means a lot to be captain. Most of those shouts were reserved for Muir herself, though. The 23-year-old, who broke the British indoor record over 5,000m in Glasgow on Wednesday night, was handed the baton in second place, after Jamie Bowness, Charlene Thomas and James West had completed their legs and admitted she had to dig deep. “I think the legs were a little bit heavy, you would expect that,” said the 2016 Diamond League 1500m winner. “But I have done 1k in warmups and 1k is a little bit shorter so I was okay. 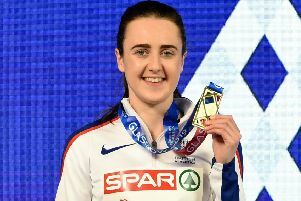 “I had to try to bring it home for the team.” To do that she had to overhaul Reekie, who was representing Scotland A and had been given a slight advantage by colleagues Jake Wightman, Mhairi Hendry, Neil Gourley. Muir, though, set an unstoppable pace on the muddy and undulating course in the capital. Breaking free of all challengers she was roared on by the home crowd as she brought the team home seven seconds ahead of USA, in second, and Scotland A, in third. It was another impressive step in her build towards peak form for the indoor season and then on to the summer and her tilt at a gold medal at the World Championships, in London. On Tuesday, she heads back to South Africa for another three-week training camp, saying it is simply a case of working hard. Whether breaking records or simply leading by example, as she did yesterday, that work ethic is always evident.